Tektronix produced the analog 1502 TDR starting in 1976. In 1986, Dr. Charles Mohr initiated the development of the Tektronix digital version of the 1502 TDR, which became known as the Tektronix 1502B. 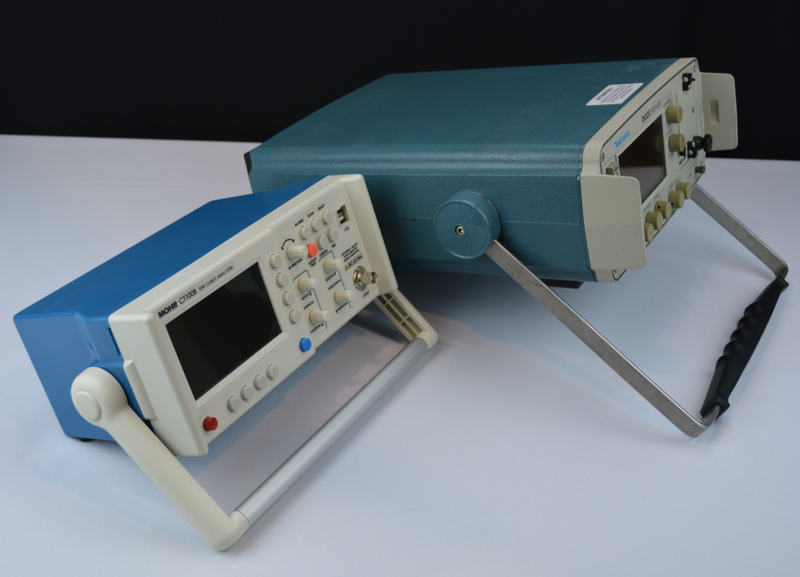 The Tektronix 1502B, and later the Tektronix 1502C, were widely adopted by commercial and military users and quickly became the industry standard TDRs. Tektronix discontinued production of the 1502 series TDRs about 2007. MOHR has developed TDR technology for over 30 years. In 2008, MOHR Test and Measurement released the CT100 TDR as the direct replacement for the Tektronix 1502C TDR. The CT100 is a faster, higher resolution TDR with greatly improved storage and analysis features, all in a more compact enclosure. Introduced in 2016, the Mohr CT100B is the latest iteration and takes additional advantage of improved computational hardware to provide features not previously available in a portable TDR. and many other commercial and military customers. * Typical system risetimes as measured at the reflected rise. + Spatial resolution is how close together two faults can be detected as separate details. † Testable cable length may be limited by cable signal attenuation characteristics. Typical coaxial cables are scannable to at least 10,000 ft (3.0 km). ‡ The CT100 can operate for an unlimited period with optional hot-swappable external rechargeable battery packs. The Tektronix 1502B/C used a step pulse signal and was able to measure cables up to 2000 ft. in length. The Tektronix 1503C used high energy, 1/2-sine shaped pulses allowing it to test longer cable runs, up to a maximum length of 50,000 ft. The resolution was not as good as the 1502C however, detecting multiple faults only as close as one foot apart. The CT100B can be used as a substitute for the Tek 1503C in many situations. The nominal range of the CT100B is 30,000 ft. The resolution is exceptional, detecting multiple faults separated by less than 1/2 inch. USB peripherals such as a keyboard and flash drive. Configuration library for repeatable reliability of measurements. Save thousands of TDR traces for later analysis and comparison with each other and/or the live trace. Integrated 10/100 Ethernet connectivity for live streaming and remote control over a LAN or the Internet. Download your TDR data to a PC for archiving and review it later with the included CT Viewer™ 2 display and analysis software. Compact size compared to Tektronix 1502 or Tektronix 1503.